We are LOVING the beautiful Summer weather around here! Really, the Winter wasn't so bad but I have been looking so forward to this time. The weather here seems to be very similar to Florida just about 5 to 10 degrees cooler and nowhere near as much humidity. That is the worst part anyway if you ask me! 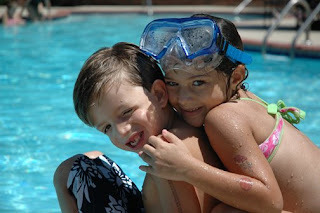 Andon and I love to go to the pool a few days a week but with the kids here we have been going practically every day. 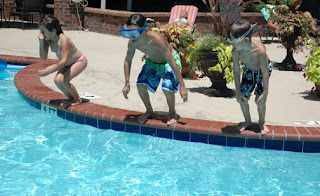 Here are just a couple pics of the kids having fun at the pool. 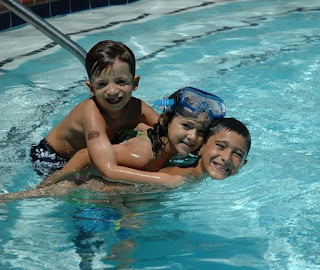 Jordan was giving Andon and Briana rides all around the pool. Taking a little break. 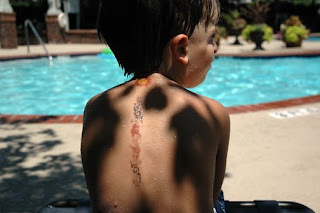 All three of them are covered in these tattoos from the party! We are having such a fun Summer. The kids will be here for three more weeks and then Andon and I will be driving them home. I am so excited to be able to spend some time with friends and family there! I'm totally loving the new postings. YEAH you rock!!! Cute pictures! We are spending many days at the pool as well. There is just not much else to do in this weather! I hope we get to see you when you come down.